The Tesla Model X is on the way, and though the electric car company hasn’t “officially” released any information yet, a huge amount of news just dropped courtesy of the Tesla website. It’s going to get 240 miles on a charge, hit 60 MPH in 3.2 seconds, and come with those sweet, sweet doors. The news comes to us from InsideEVs.com, and was obtained when Tesla invited early “Signature” reservation holders to start configuring their cars. A lot of the information hadn’t been released yet, so we’re hearing much of this for the very first time. And though Tesla hasn’t sent out an official confirmation of the info themselves, they did confirm to us that all of it was spot-on. 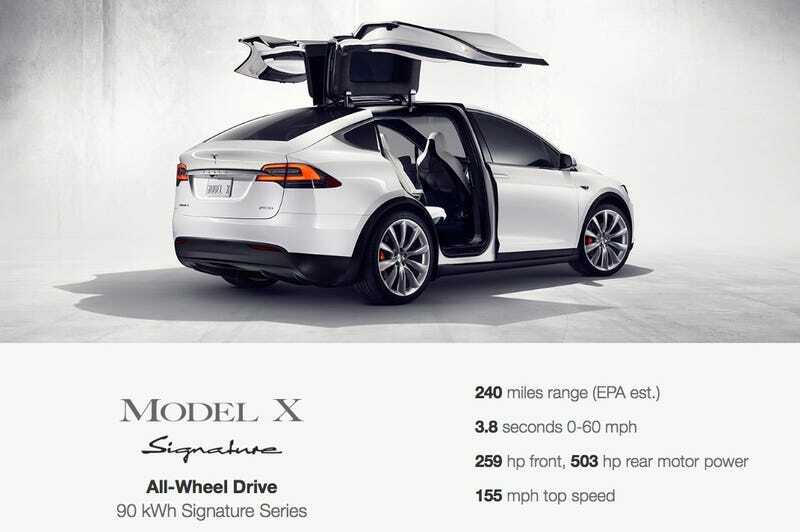 Tesla estimates the price of a base Model X to cost about $25,000 less, but even then, you’re starting at over $100,000. But for the earliest edition available, the “Signature” series, it’ll set you back $132,000, which is just the base price of the launch edition. And sadly, it will only get you up to highway speeds in 3.8 seconds, which is just barely Ferrari F40 territory. If you want to get it up to true Ludicrous Mode, with its requisite acceleration of 3.2 seconds to 60 MPH, it’ll cost you another $10,000. Throw in a couple of options, like the tow package, and you’ll get it up to $144,000. For comparison, a BMW X5M starts around $98,900, and a Porsche Cayenne Turbo will set you back $114,700 to start. Both are a bit cheaper, but neither comes with a stonking 762 horsepower. While the outside looks much like the original Model X concept we saw a while back with just a bit more chub, the interior is very Tesla Model S-ish. Which is odd, considering that the car itself was delayed over what company CEO Elon Musk said was the back seat. Musk called the seats a “sculptural work of art” at the time, but they kinda just look like some seats to me. It also may have just been a supplier issue, but who knows? But this is the future, when it comes to those who want to do some mild well-heeled suburban soft-roading. Welcome it.